Flax seeds (Alsi) are very nutritious and one should regularly have these in daily diet. 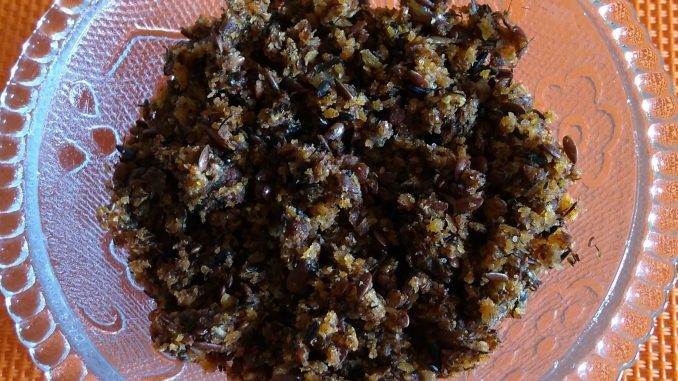 This dry chutney has Alsi, Karale Til (Niger seeds / Khurasni), Dry coconut and Garlic. Karale til is not commonly used in many households. It is rich source of Calcium. Karale Til are called Khurasni in Gujrati, Ramtil in Hindi and Niger seeds in English. In case you don’t have these, you can use normal black til (Black Sesame seeds). 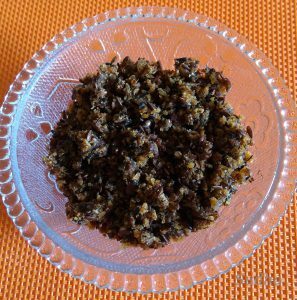 This chutney goes well with any Chilla, Ghavan and curd rice. 1. Roast Alsi and Karale Til / Khurasni separately till they start sputtering. 4. Transfer Karale til to a grinder. Turn the grinder on pulse for three or four seconds. Avoid pulsing it for more than a few seconds, or the seeds may clump together. Attempting to grind too many seeds at once may also result in clumping. 5. Coarse grind roasted Alsi in similar way. 6. On cooling grind the roasted grated coconut in a grinder to get coarse powder. 7. Crush garlic cloves separately into a smooth paste. 8. Add salt, red chilly powder, jaggery and tamarind (chinch) and mix well. 8. Add Alsi powder, Karale til powder, coconut powder to garlic mixture, grind to form a uniform mixture. This chutney lasts for 2 to 3 weeks without refrigeration if stored in an air-tight container. How do I get or update with your receipes. Write a comment on any of the recipes on this blog and click on “notify me on new posts”. You will get an intimation when a new recipe is posted on the blog. There is no facility to provide recipes on mails.